Sara is originally from Winnipeg and developed a love for northern ecosystems when working in Churchill, Manitoba. Sara has an undergraduate degree in Biology and Geography from the University of Winnipeg. Sara joined the NPEL lab in 2011, where she worked on plant reproductive processes in alpine tundra at Wolf Creek, southern Yukon. Since completing her degree, she has been working and adventuring in southern B.C. Xanthe is originally from Saskatchewan and became interested in northern ecosystems while doing an undergraduate research project in the NPEL. After completing her B.Sc. degree at the UofS, Xanthe completed a M.Sc. degree at UBC under the supervision of Dr. Greg Henry. Xanthe returned to the NPEL in January 2011. Her PhD research focused on using dendrochronology techniques to assess climate change impacts on ecosystem resilience and succession in the boreal forest. After defending her PhD in spring 2015, she joined the lab of Dr. Michelle Mack (Northern Arizona University), where she has led further research on boreal ecosystem ecology in the NWT and Alaska. 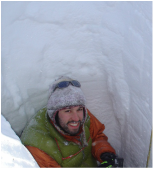 Steve joined the NPEL in August 2012, where he has been leading research on dendroclimatology at the southern and northern margins of the boreal forest. Steve is originally from Edmonton, Alberta, and completed his M.Sc. and Ph.D. degrees in Earth and Atmospheric Sciences at the University of Alberta under Dr. Peter Kershaw. The focus of Steve's graduate research was on range limits of tree species at arctic and alpine treelines, and how treeline pattern and process are shaped by climate and environmental change. His work at the NPEL focuses on: i) determining controls on forest range expansion at treeline near Wolf Creek, Yukon Territory; and ii) assessing the sensitivity of tree species to climate variation along moisture gradients in the southern boreal forest of central Saskatchewan. Matt is from Saskatoon, Saskatchewan, and graduated from the University of Saskatchewan with a B.Sc. in biology. Aside from his interest in northern ecology, Matt loves birdwatching and is an avid classical guitar player. His thesis focused on the impacts of disturbance on invasive plant colonization in black spruce forests of interior Alaska. Following completion of his degree, he has worked on conservation and restoration projects for Bird Studies Canada and the Canadian Wildlife Service. 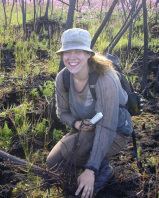 Kirsten is another Saskatchewan native and past graduate of U of S. Kirsten's research focused on plant-soil interactions with respect to temperature and nutrient dynamics in the alpine tundra of southern Yukon. Kirsten successfully defended her thesis in fall 2012 and currently works as a consultant in Saskatoon. Carissa originally hails from Thunder Bay, Ontario and Lakehead University, and has a M.Sc. degree from Carleton University. 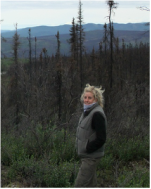 Carissa's Ph.D. research focused on fire history and climate change impacts on the structure and composition of treeline black spruce in the north Yukon. Carissa moved from the NPEL to a post- doctoral position at the University of Sherbrooke, Quebec (Velland lab). She is now a faculty member in biogeography at the Department of Geography, Memorial University, Newfoundland. Emily is originally from Minnesota, and also has French citizenship. She completed her undergraduate at the University of Minnesota, and then worked for several years as a research technician at the University of Alaska Fairbanks. She is interested in the conservation of coastal ecosystems, and conducted her thesis research on the vegetation dynamics of dune ecosystems of Sable Island, Nova Scotia. Emily was co-supervised by Dr. Phil McLoughlin at U of S, who conducts research on the horses of Sable Island. Emily defended her thesis in the fall of 2011. Since then, she has been working as a research technician in various Biology labs (including NPEL!). Follow Emily on her website. Jayme is a native of Saskatchewan and completed her undergraduate at U of S. Jayme got interested in northern treeline systems while working as an undergraduate research assistant in the NPEL, and returned to study the effects of stand age (and fire frequency) on seed production of black spruce in the north Yukon. Her research identified age thresholds in the time required for black spruce stands to start producing seed (~30 years), versus the time requirements for reliable seed production (~80-100 years). The results of her thesis provide a basis for estimating how increases in disturbance frequencies could affect the regeneration potential of black spruce forests in northern Canada and Alaska. Viglas, J., Brown, C.B. and Johnstone, J.F. (2013) Age and size effects on seed productivity of northern black spruce Canadian Journal of Forest Research 43: 534-543. Sara is orginially from Ontario and completed her undergraduate degree at Trent University. Sara is an accomplished sportwoman as well as a bright young scientist. Her thesis research (now complete) examined the responses of alpine tundra vegetation to variations in climate in the mountains of south-central Yukon. Sara has been completing a Ph.D. at Trent University.